Followed that up with one of my favorites, fried catfish, two pieces. They use a corn meal batter that I just love. Even though I remove the breading, I can taste it in the fish. Removing most of the breading cuts the calories and fat content. Some steamed broccoli. Excellent food, fiber and low in calories. Here is one of the traps to avoid on a buffet. I had the equivalent of two cups of broccoli. Immediately adjacent to it on the serving table is a giant bowl of some kind of liquified cheese. Now, the broccoli alone is less than 100 calories, but if you decide to drown it in cheese, you shoot the calories through the roof, not to mention the glob of bad fats you are putting into your system. Next, was sweet corn. I had two half ears that were wonderful. I enjoyed the cinnamon-sugar topping on the oatmeal so much that I had a second bowl for dessert, along with an apple. The two bowls of oatmeal amounted to just over 300 calories, the catfish which I estimated at 6 ounces was another 250. (I scrape off the breading) The sweet corn amounted to 180 calories and the apple just under 100 calories. I would be willing to bet that I ate less than 90% of the folks at the buffet, yet I still consumed a total of 930 calories. That is almost half my 2100 calorie budget for the day. 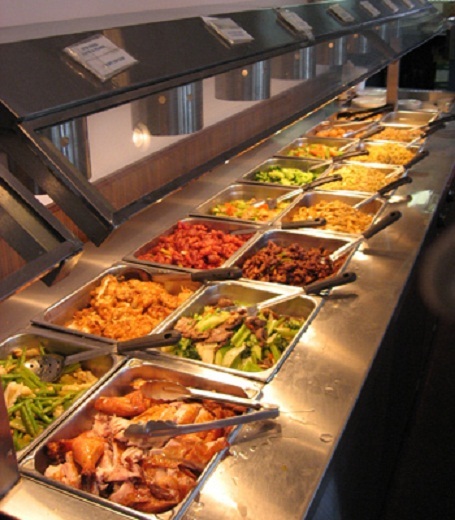 I left the buffet satisfied and comfortable. Must confess that one of my favorites on this particular buffet is their apple cobbler which is warm and melts in your mouth. I didn’t have any on this trip because the weather here had been bad and I feared I would not be able to ride the bike and burn off the 300 odd calories from it.